Stretching the One Income Dollar: Thermal Aid Zoo –A Great Concept: Plus a Giveaway! Thermal Aid Zoo –A Great Concept: Plus a Giveaway! We all know that warmth can comfort and soothe better than many things. This warmth is the concept behind a new line of toys called Thermal-Aid Zoo which are flying of the shelves. This is a collection 5 cuddly stuffed animals that have heating/cooling properties and are designed to comfort the kids as they need it. You can warm up the stuffed animal in a microwave for a little bit and offer it to the child as they venture to or return from the cold, or simply to snuggle with at night. If you need to reduce swelling and ease pain, you can pop the stuffed animal into the freezer, where it will become cold and be able to soothe those aches and pains-ideal for teething toddlers. 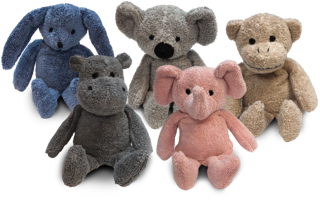 These animals featuring a bear, monkey ,hippo, rabbit and an elephant, are made of natural cotton with a specifically designed heating/cooling element that allows them to be hand washed as needed-which if they become your child’s favorite new toy, they may need to be washed quite a lot. This is a great concept that allows mom to provide soothing comfort to the child in a fun and cuddly way that they will love. **You can find the Thermal-Aid products at www.costco.com , www.cvs.com and www.thermal-aid.com. There is also an opportunity to win your choice of one of 2 of these soothing toys through The One Income Dollar. . Your choice of which animal if you are chosen winner. There will be a random draw by Random.org from all entries received on April 28, 2013. Leave your email address and tell me which of these toys is your favorite. I would like the Rabbit! soncrazed@aol(dot)com My kids have a monkey themed room & the monkey would be perfect for them! I *adore* the monkey one! So sweet! love the rabbit day4adaydream@hotmail.com thanks for the chance to win one of these! The monkey is my favorite. Hopefully you can visit Utah and have an event here, you guys definitely love Salt Lake City events we have a free listings in any events. The monkey is my favourite! I would love to own the monkey! I like the koala bear-so cute! I love the monkey.so cute! I love the pink elephant.